“The Little Red Hen” is a tale that has been for generations. There are several versions of this tale and the original author is Margot Zemach. 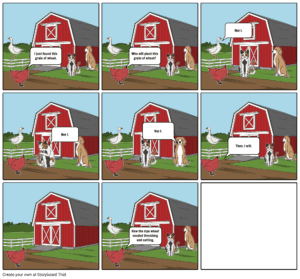 The version animated in my animation was the version with the hen, goose, dog, and cat. First, I wrote a script of exactly how I wanted my animation and storyboard planned out. The script had a major decision being taken, however, then I analyzed the story and found my mistake. the first decision the main character makes would impact the entire story. This is the reason why my first decision at end of Act 1 had to be altered and I explained this in my Developer’s Log. The storyboard clearly expressed my final decision and I was very pleased with it. I worked in both school and home, however, more time was spent at home. The final scratch animation gives consequences on both versions of Act 2 based on the main decision made at end of Act 1. In Act 2A, the hen works by herself on making the bread and since she put most effort in, she gets the reward to eat it while other watch her. 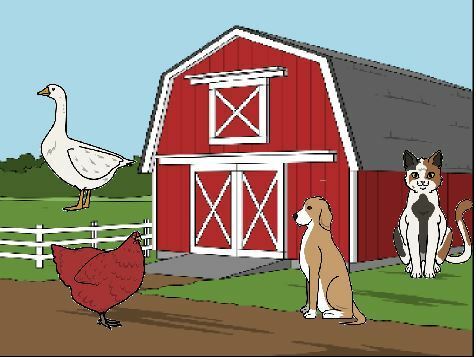 In Act 2B, the other animals work while the hen watches them. Therefore, in the end, the other animals share the bread while the hen watches. It took quite a long time to complete the animation and my computer gave some difficulties. However, I was able to successfully submit this project with a happy face. The Little Red Hen Remixed by Srewashi is licensed under a Creative Commons Attribution-ShareAlike 4.0 International License.